It’s almost trick or treat time. I wish I could say that I’m ready, but I’m not. My kids’ costumes were ordered and still haven’t arrived. I am throwing a party in my front yard this year with my neighbor so we can feed the kids healthy food, play games and wear them out a bit before trick or treating. We did the same last year, and they were pretty full from healthy food before all the candy so it was a success! We made almond butter and jam sandwiches, fresh fruit, vegetable sticks with dip, hummus and pretzels and ice water. Any fun ideas that you all are planning? I’d love to hear your ideas! My 2 year old has a jack o lantern sandwich made from the heel of the bread loaf and filled with pumpkin butter spread. She also has black olives, cantaloupe pumpkins, dried apricot pumpkins and at the top left is a nut and seed mixture with dried cranberries complete with zombie hand and tombstone. 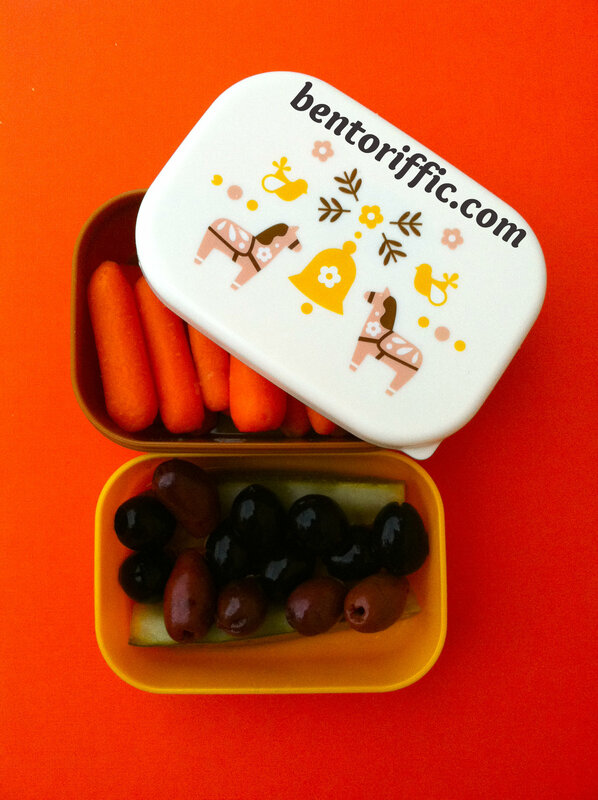 At the top right is a peeled clementine packed in her Easy LunchBoxes container. 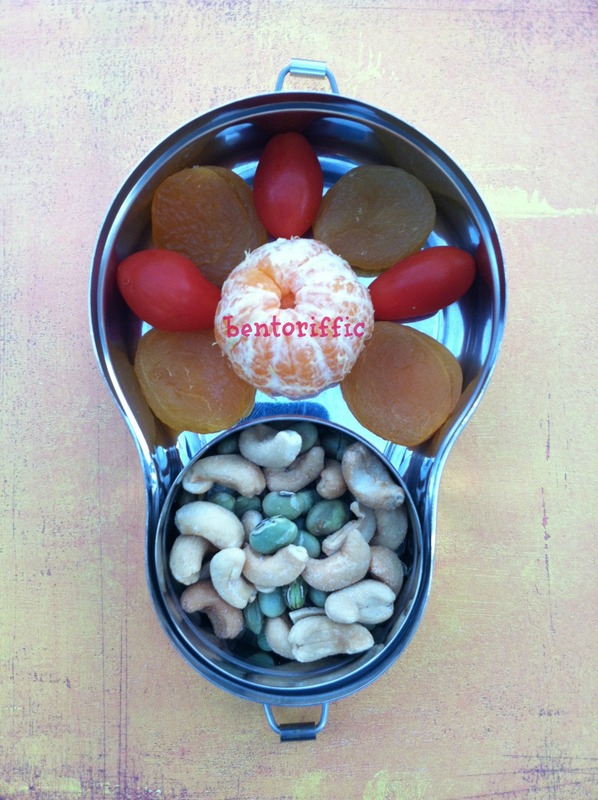 Little Miss G (4) has a similar lunch today. 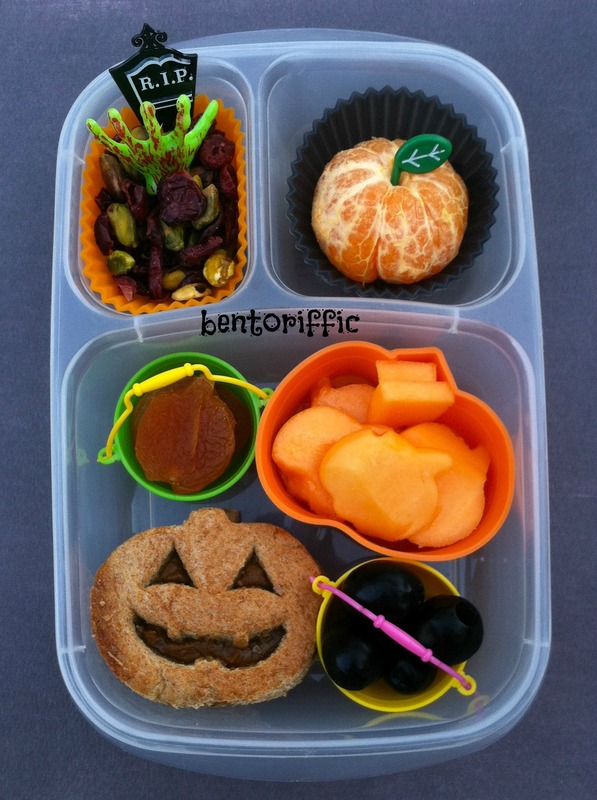 She has the same jack-o-lantern sandwich, a jack-o-lantern clementine, pumpkin shaped dried apricots and trail mix of nuts and berries in her Easy Lunchboxes Mini dipper container. 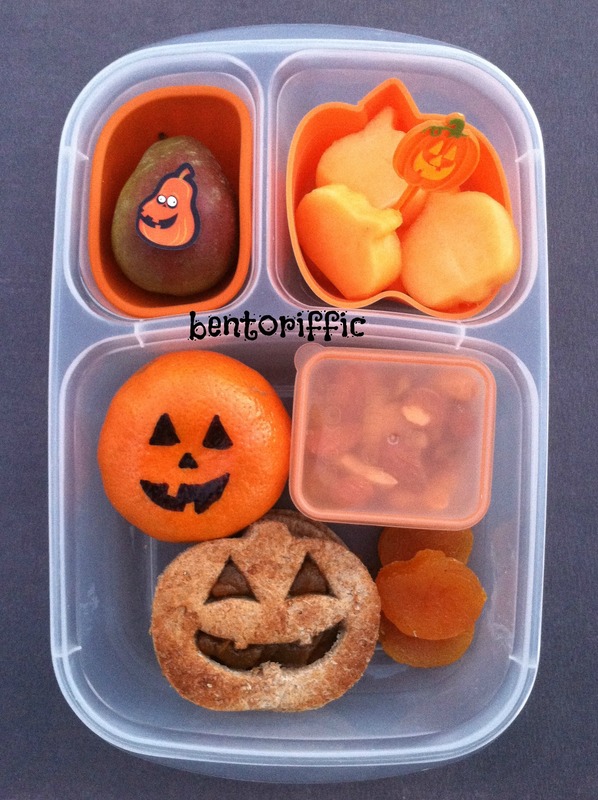 At the top left is a seckel pear and at the top right are pumpkin shaped cantaloupe pieces packed in her Easy LunchBoxes container. 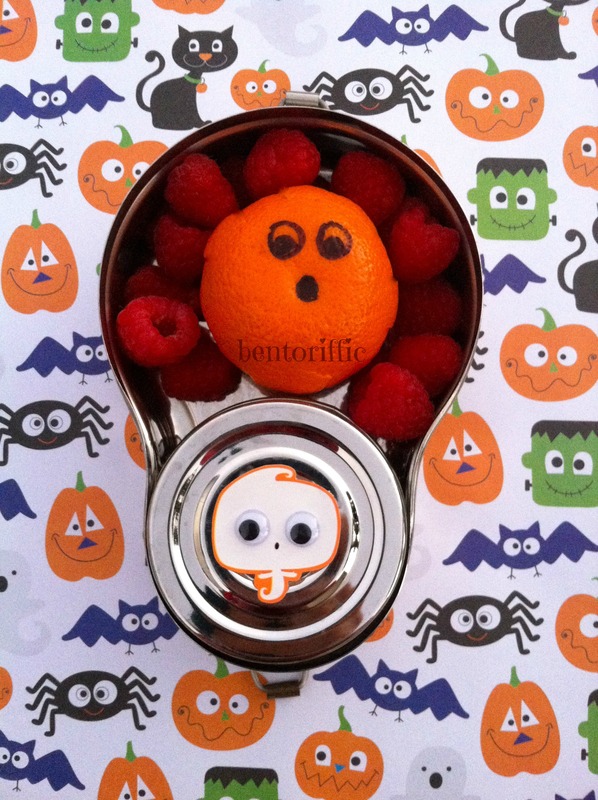 And for a snack I packed a Happy Tiffin stainless bento with raspberries, a clementine ghost and the round container full of cashews. The winner of my GreenPaxx reusable straws and lids giveaway is Corey from Family Fresh Meals! Everyone is still a winner as Cindy from http://greenpaxx.com is offering 20% off with the coupon code SUMMER at checkout on her website through September 14th, 2012. Some of her products are also available on Amazon.com. Who has time to make these lunches? If I had a nickel for every time someone said that to me, I’d have a whole lot more in savings. The answer is anyone. It doesn’t take as much time as you think. Grab a mini cutter and try it! 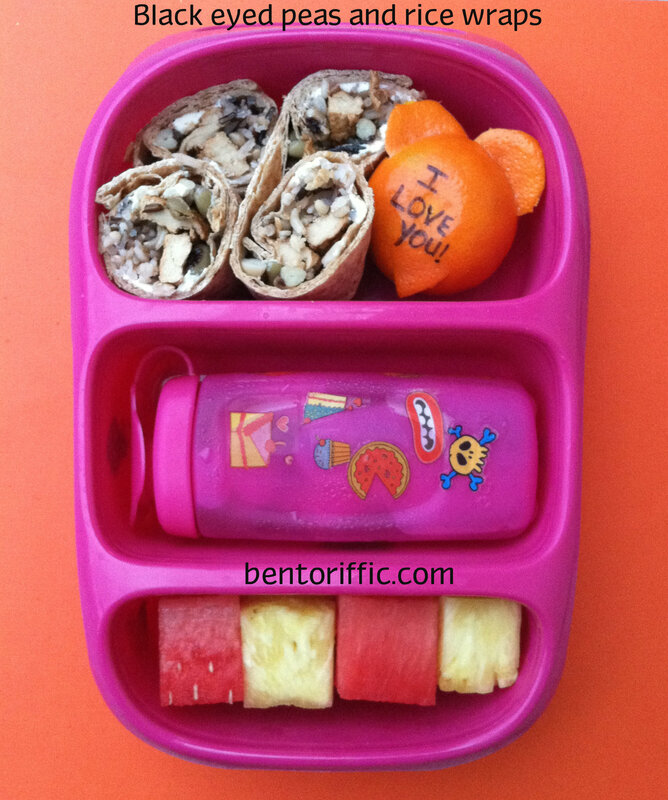 Today I’m posting some not as pretty lunches. They took me about 5 minutes each to make. Still cute, still healthy and barely any time at all. 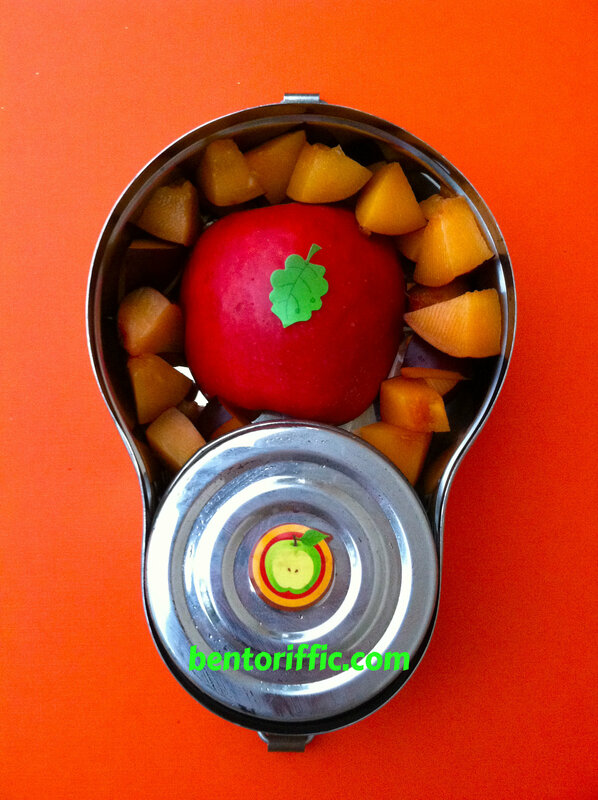 One of my favorite lunch tools is the Lunch Punch cutter sets. 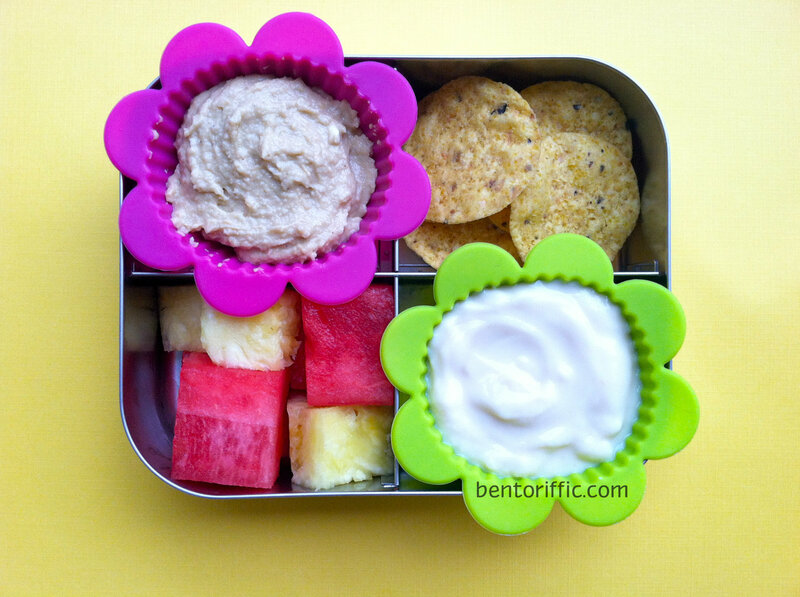 They are super quick, cute and simple to make lunches. At the top left are pluot slices and sugar snap peas. 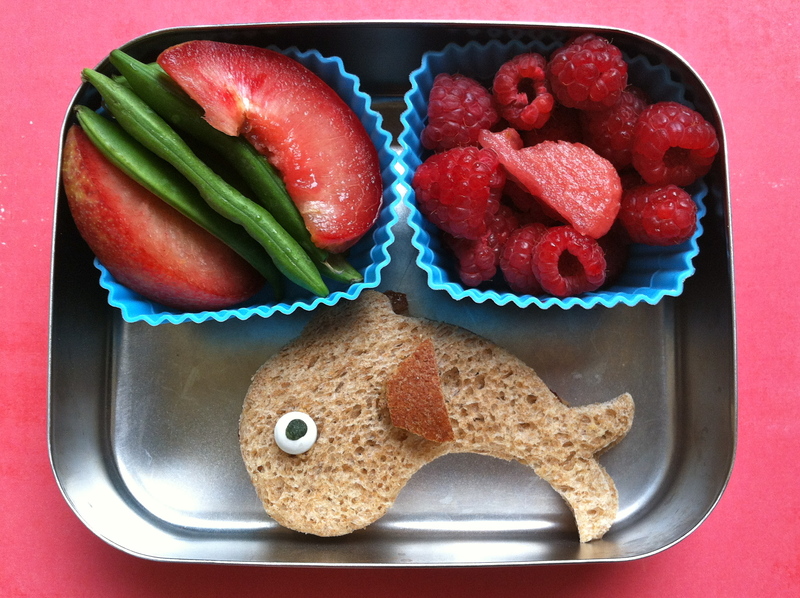 At the top right are raspberries and a watermelon whale packed in a Lunchbots Uno. Miss Four Year old had mini leaf and flower sandwiches are almond butter and jam with hummus and black bean crackers for dipping at the top. 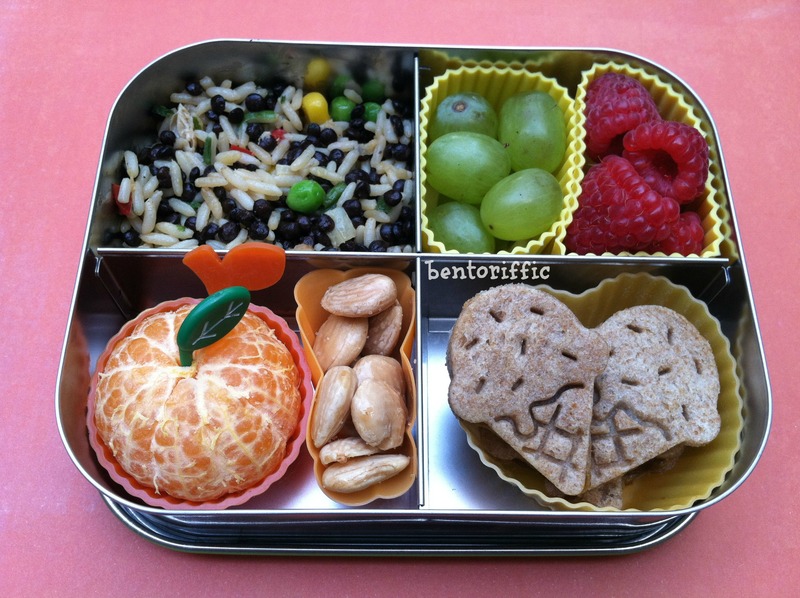 Her Goodbyn Bynto lunchbox has a water bottle that fits in the middle and below that I packed sugar snap peas and watermelon pieces. My husband had leftovers from dinner that we will definitely be making again! I made my own version of this recipes for Six Sisters’ Stuff Spicy Rice and Bean Wraps that I found on Pinterest. I made it vegan, and I keep out the spice at least for the ones I made for the little ones. We added a little salsa on the adult versions at our house. I used whole grain tortillas for the wrap. In a bowl I mixed 1 cup of brown rice and quinoa mixed, 1 can of pinto beans (what I had in the pantry), and 1 tsp cumin. I smeared a small bit of Tofutti brand vegan sour cream on the tortilla, then I loaded up with rice, quinoa and pinto bean mixture and added some julienned carrots and cucumbers on top. I rolled them tightly, cut & served with sides of green and red salsa for the adults. Dinner and leftovers for lunch too! At the bottom I packed some sliced kiwi and cantaloupe in a LunchBots Duo. We’re off school next week and headed out of town so I have to get my Thanksgiving lunches done in the next couple of days. 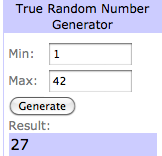 This one was a lot easier than I thought it would be. 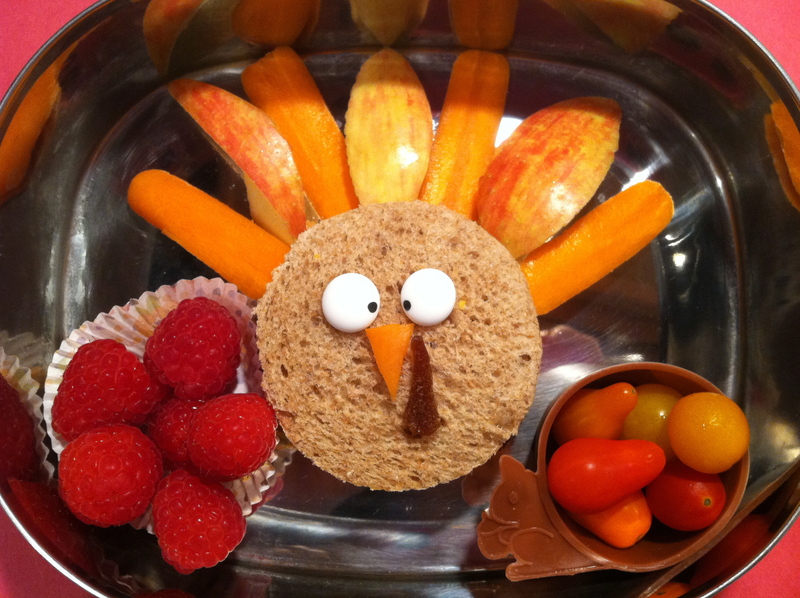 Just a soy butter and jelly on whole wheat with a carrot beak, fruit leather waddle and candy eyes. His feathers are apple and carrot slices. Raspberries are to the left and heirloom grape tomatoes are in the squirrel cup. Also included are an applesauce, Lifeway berry kefir & ice water. 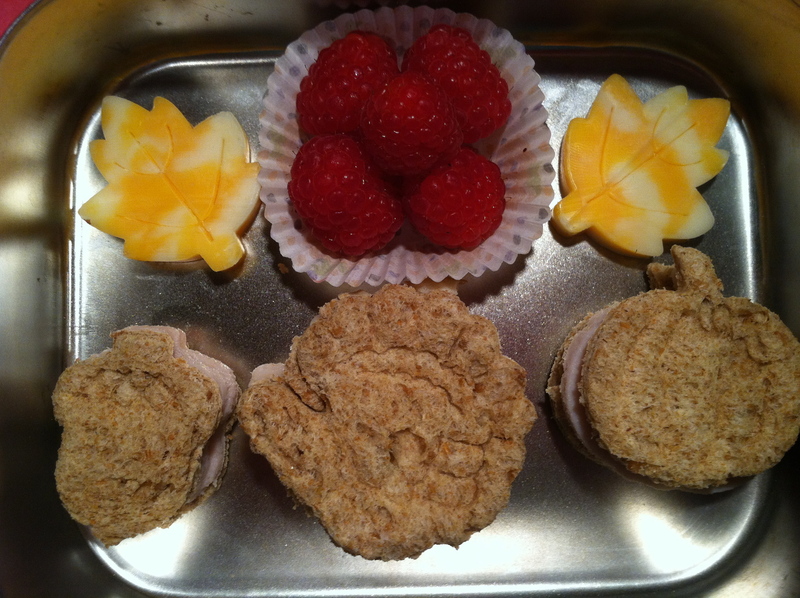 Little sis gets some fall festive sandwiches in turkey, pumpkin & acorn shapes with just turkey inside. Colby Jack cheese leaves are above with raspberries. 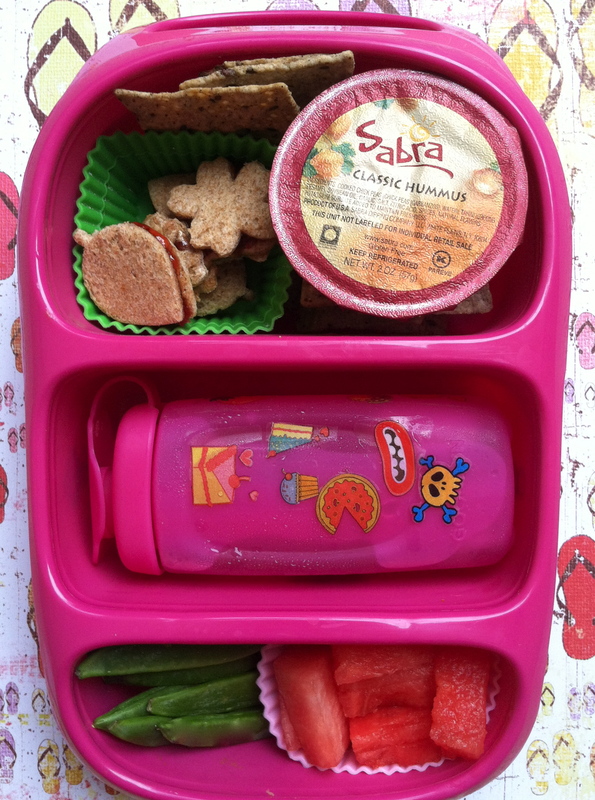 Also included in her lunch are Craisins, and applesauce, Lifeway berry kefir and ice water too. 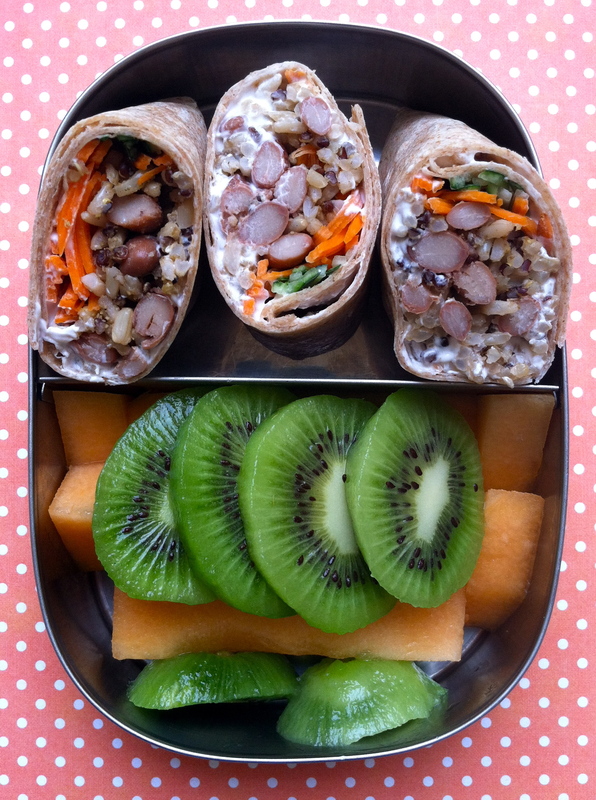 Both girls’ lunches are packed in LunchBots stainless containers.